Vobal Technologies provides pre-paid VoIP service to the ship, and can even provide GSM service to all mobile phones onboard. The service can include inbound and outbound calling and SMS messaging. We provide FlexPricing to end-users, where crew prepays for service and their prices reflect how much the vessel operator wants to subsidize -- or profit from -- crew calling. Pre-paid accounts where individual crew members pay for bandwidth in their minutes ensures individual usage is properly tracked and billed. Pricing plans for calls can be set, based on the bandwidth cost plus the call termination cost. High quality voice at low bandwidth over the satellite link. We support both dedicated phone lines as well as payphone-style "open phones". 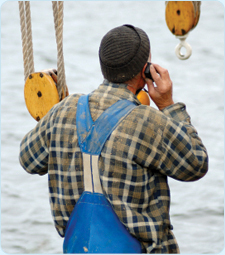 Crew members can call and SMS each other on the ship for no cost. U.S. Telephone numbers for all mobile handsets. Crew members can view their balance and call-activity online. 24/7 Network Operations Center for support to fleet operators. Crew members buy top-up vouchers or PINs.